EDWARDSBURGH-CARDINAL - "County Council voted six in favour vs three opposed to the motion to resume negotiations with Tomlinson. The matter is now entirely in the hands of County Council...and having voted against the motion to resume negotiations it is inconceivable that I will be further consulted during the negotiation stage." Those are the words of Edwardsburgh-Cardinal (E-C) Mayor Pat Sayeau in reaction to the United Counties of Leeds and Grenville Council's decision to resume negotiations for the sale of the ED19 landfill site located in Edwardsburgh-Cardinal Township. The announcement was made on Thursday, September 21 in the wake of closed-door meetings in August and again on Thursday, held to consult with lawyers hired to advise on the legal options available to the county. The motion to resume negotiations was held in open council. It passed with support from six of the nine mayors present supporting the bill. Augusta Mayor Doug Malanka Mayor, Edwardsburgh-Cardinal Mayor Pat Sayeau and Merrickville's David Nash voted against to reopening the negotiations. Sayeau was quick to point out that while the vote gives county staff the ability to reopen talks, the sale in not yet complete. "The property is not yet sold and there is not even an offer to purchase on the table," Sayeau explained, alluding to the hope that, if the land is sold, there might be conditions favourable to his host township. "Negotiations to sell the property will be conducted on an as-is-where-is basis with no guarantees and have now been left to staff, assisted by legal counsel, and it will be some time before staff returns to the Council table with an offer...if at all. At various public County Council meetings over the past eight months, various members have stated minimal conditions, which they expect to see in any offer and these include the original conditions guaranteed to the township of Edwardsburgh," Sayeau stated. Facing heat from constituents at Monday night's regular council meeting, Mayor Sayeau reiterated his stance that there was no options left on the table for E-C Council. "That whole issue (ED19) is out of our hands completely. That ship has sailed...it is already beyond us," Sayeau replied to citizen requests that he continue to champion the cause on behalf of the municipality. Amidst cat-calls from angry residents who heckled both the mayor and deputy-mayor to step down over their perceived lack of support for the fight against ED19, a couple of Councillors showed interest of stepping up and pursuing avenues to oppose the impending sale of the site. "The decision to continue to negotiate with Tomlinson isn't a surprise - but it's disappointing," stated Councillor Michael Barrett, who has presented numerous motions calling for stronger actions from E-C Council in response to the landfill situation from the onset of public concerns over the situation. "As part of Edwardsburgh-Cardinal's overdue Official Plan Review - Council could seek to have the zoning of the 578 acres in question changed to agricultural. Or at least seek to restrict future expansion of a dump by rezoning all but the 35 acres approved almost 20 years ago for use as a dump. This type of change would require the approval of the County - but regardless of how one might expect the County to respond - I think that public consultations and proper study of the land use impacts, in 2017 and beyond, is an important exercise," Barrett concluded. Councillor Karie Smail, representative of the township ward where the proposed dump would be located and the sole council voice that supported Barrett's earlier attempts to present a stronger stance against the land sale also voiced concern over the county's decision. "My reaction? I was very disappointed in my fellow political colleagues; there was little concern for the impacts it is going to have on this community's future. My thoughts are spinning around about our property values, housing growth and overall moral of this community," Smail said. "Residents feel their concerns were devalued and unheard. I would encourage them all to keep going on the fight and know I'll be right there to support in anyway I can. To the mayors who voted in favour of this, shame on you for tossing our opinions to the trash. I certainly hope you realize the damage you have done," she finished. 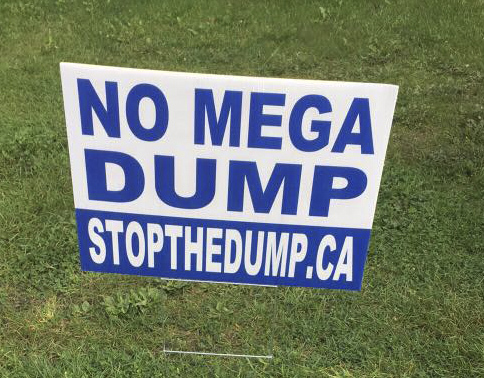 Citizen Against the Dump (CAD) spokesperson Kyle Johnston says the fight is far from over. "CAD will actively pursue all legal and political means at its disposal to oppose this outrageous idea. We will continue with our 11.4 application to the Minister to overturn the EA (environmental assessment), and we will seek legal advice on stopping the sale in the interim," Johnston told the Journal. "We have also now learned that the Akwesasne Mohawk First Nation have written to Minister Ballard and indicated that they were not consulted on the original EA. (See complete letter on page three) The crown (the province) has a duty to consult this First Nation and it is clear that they are in violation of this very important legal principle." CAD will continue, Johnston states, to argue on the merit of the outdated EA. "For twenty years there has been no political will to develop ED-19; for Counties Council to try to do so now is appalling, especially considering the original purpose of the dump - to handle garbage for the Counties only - has changed."